Not sure which specific models have pull out cleat options, but I noticed 2 of mine were a bit loose and would slide up and down using your hands. Does anyone have any experience with this issue? 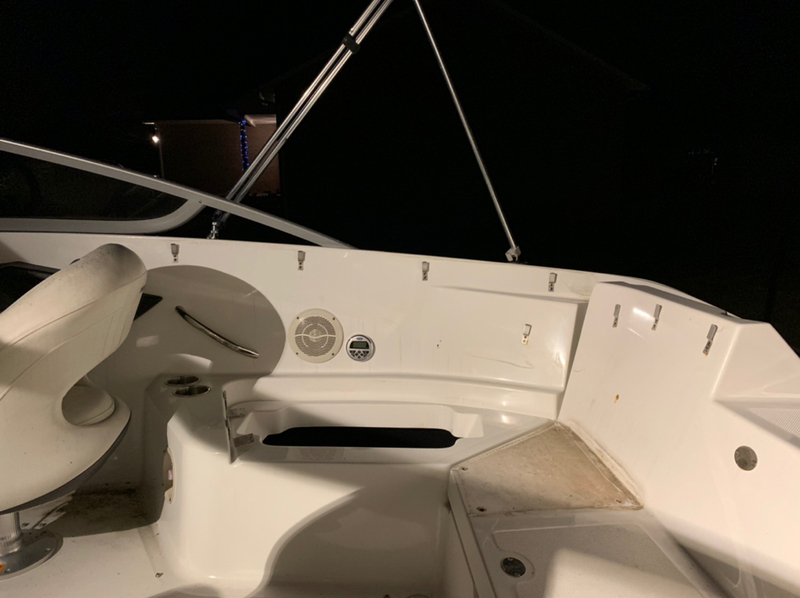 May attempt to remove the seats to hopefully access it and, if I have to replace them, try to get 6" cleats (Find the 4" cleats rather small for the boat size"). Can't you simply tighten them up? The pop up cleats on our 210 are fine. That is my current plan for this weekend. Just need to figure out how to remove the rear seats to access them since I can't tighten them from the outside. Looks like you have a 210 Challenger... What cleats need tightened? My boat is in storage right now and I can picture a need to remove the seats for this task. You should be able to reach up from the open seat. ...or remove the speakers to gain access. The rear cleats are lose and for me, I haven't removed the seats before so it's a matter of trying to figure out how to do that without messing things up. But If I go through that trouble, I may just end up swapping out the cleats for larger 6 in pull out cleats if I can find them as I find trying to put bumpers and dock lines on them just too small for that. I will probably end up tightening it. 4" is fine, just could do better, if that makes sense. I'm not totally against 4" but if I get a 6" cleat, would feel more comfortable tying up. Had some issues with putting bumpers and dock ropes and a small wave was able to push the boat enough to cause the one of the dock ropes to slip off the cleat. But I generally don't tie off at the dock, just drop someone off to get the truck and back it down for me, but when I do use the cleats, just ehhh. Hmm. When we tie off to a dock, we run the dock line up through the center "hole" in the boat cleat and then around the ears. Then we can put the fenders around the ears. Works perfectly. Thank you for that illustration. I also do the same thing and works fine for me as well. I don't have any issue with the stock cleats, just figured if I have to access the cleats to tighten them up, I may as well use it as an excuse to upgrade the cleats to 6" cleats. Not sure if you’ve tried it yet, but on the 210 Challenger there is nothing behind the seat backs. I have mine out for reupholstering. I'd love to know what you paid for the upholstery job. I saw full replacement cushions for about $3K for the whole boat including the captain chairs. It’s not done, yet. I’ve spent the pstaplesIast month or so removing the vinyl intact from the 17 cushions. Thousands of staples removed. I have an upholsterer who is going to seam rip, pattern, and sew the new vinyl. The vinyl is naugahyde dolphin, and I’ve spent about $350 on it so far. I didn’t want to over buy, so I may need to order a little more. Wow, thanks for the update! I have not tried that yet, been busy but I am having the dealership look into it. (They're checking out some electrical issues with my ECMs and odometers). How was removing the seats? I definitely want to remove the back cushions that are on the engine hatch and clean up all the dirt and grim that has built up behind them. Hey. Removing the seats is easy. Run your hand along the bottom of the backrest until you feel a little gap in the backer. This is where a single Philips screw is placed (about where the arrow is in the picture). Compress the cushion upward to see/remove the screw. After that, you just push upward on the seat back and it will slide off of the hangars you see in the picture. Same method for the front. The bow cushion has two screws (if memory serves). Seat bottoms are all hinges or bolts. The bow seat back hinges are riveted in, and have to be drilled out. The rest are super easy. Thank you very much for that walk through!